Interesting Facts About Baltic Amber. Learn from Experts. People have been enamored with the incredible magic, mystery and medicinal power of Baltic Amber for more than 5000 years. And because there are always different versions of questions and answers depending on the sources, that is the case with Amber as well. So there are two versions that dominate although neither will yield to the other as final fact - one is based on scientific research and the other on folklore. There is no question that Baltic Amber is a mineral and organic in nature and belonging to the category of Resins. And scientists took centuries to actually reach a consensus. For example there were researchers who were positive Amber was made of hardened oil. Others maintained that Amber was fossilized honey produced by wild bees. Then there was the theory that Amber was sea-foam that had hardened under the influence of sun beams. And further, others considered Amber to be the core product of forest ants, solidified ''sun ether'', mountain oil, earth mineral fertilizer and - well, you get the idea! 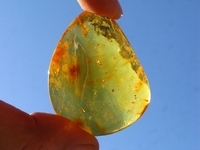 The reality is that Baltic Amber is not only completely different from other semi-precious stones, but it is completely unique in all the world. Consider that Amber comes in a great variety of forms, textures, structures and sizes, Amber comes in an amazing wealth of Amber Colors, Amber has unusual chemical and physical qualities that have dumbfounded researchers. Consider that burns in fire like coal crackling and smoking, it melts when heated, it produces static electricity if rubbed. The Baltic Amber stone is warm and comforting to the touch. And did we mention that you can see different insects inside some amber pieces? Seriously? Absolutely. And although Amber is often found on the sea shore, butterflies and flies never lived in the sea. *Natural Amber comes in more than 300 different shades! The most common colors are Honey, Cognac, Lemon, Cherry, Green and Butterscotch. *The ancient Roman rulers valued Baltic Amber so highly that they started wars in order to conquer areas that had large deposits of Amber. *In ancient China people would burn Amber during big celebrations. Thus a host could demonstrate his wealth and at the same time show respect to their guests. *The term ''electricity'' actually stems from the Greek word ''electron'' which is the Greek name for Amber because it can store static electricity. * Famous Hippocrates (460-377 BC) father of medicine, in his works described medicinal properties and methods of application of Baltic Amber that were later used by scientists. *Nicolaus Copernicus documented that his formulas for medicine included 22 specific ingredients --- and one of them was Baltic Amber. *Since ancient times Baltic Amber has been used in making Amber Jewelry for Healing. *Insects, spiders and their webs, annelids, crustaceans, bacteria and amoebae, marine microfossils, wood, flowers and fruit, hair, feathers and other small organisms have been recovered in Ambers dating to 130 million years ago. * The presence of Insects in Baltic Amber was noticed by Pliny the Elder in his Naturalis Historia and led him to the (correct) theory that at some point, amber had to be in a liquid state to cover the bodies of insects. So in reality scientists stayed the course of gathering evidence to declare the truth while people throughout history were quick to attribute the wonders of Natural Baltic Amber to the supernatural. Maybe there's more to the story? Only time will tell!